I was lying in bed, debating whether to get up or give myself 5 more minutes, as my toddler headed to the bathroom. That’s when I heard the sound. Not so much a tinkling in a small pool of water like I was expecting. More like a hose spraying the side of the house. A groan escaped me. I went to investigate. With a click of the light switch, there it was. A lovely pool of yellow on my tile floor with a thorough spray spanning the wall. Someone had missed the toilet…completely. My toddler never fails to lift both lids, meaning he even lifts the seat. Bless him. He always flushes. And get this…he even uses a small tab of toilet paper to wipe the rim. See, he should get a reward or something! But this morning went a little awry. Maybe he was tired, maybe he had to go too quickly. I don’t know. But there was a mess to clean up before I even got out of bed. Ugh. After clean-up, I noticed the toilet was now backed up with too much toilet paper. Oh, did I do that? In fact, it was near the rim, ready to overflow. So I grabbed the plunger. It’s one of those rubber kinds. Have you ever had the rubber part flip the wrong side out? Yep. That happened. And when I tried to flip it back, can you guess what came next? Toilet water sprayed all over the same wall. I had to clean it twice. It can take on many forms. Now this potty accident didn’t really stress me out. It just wasn’t a great way to start the morning. But countless things throughout our day can create stress. Some days it’s a true battle. It can feel like the world is on our shoulders. Not the whole world, but our own little worlds – the worlds of our families. And we “moms” typically have a hand in most of it. For example, we’re often the planners, schedulers, and timekeepers. Do you ever feel like the white rabbit in Alice in Wonderland, constantly checking his pocket watch? When I pick you up after school today, we need to move quickly to get to your haircut appointment and then make it home in time to finish dinner before 6:00. Honey, I’ve ordered the cake from the grocery store, the balloons from Party City, and sandwiches from Subway. We need to pick them all up on Saturday before the birthday party. Can you help with that? Those are just 3 roles we take on – there are countless others. I’m not sure the list ends, really. The good thing is most days we don’t realize all the roles we play. They just all get wrapped up into our awesome Mom-ness. But I recently added a new one to the list, one I’d never considered before. Not until I looked at the world from someone else’s perspective. We tend to focus on the stress we have. 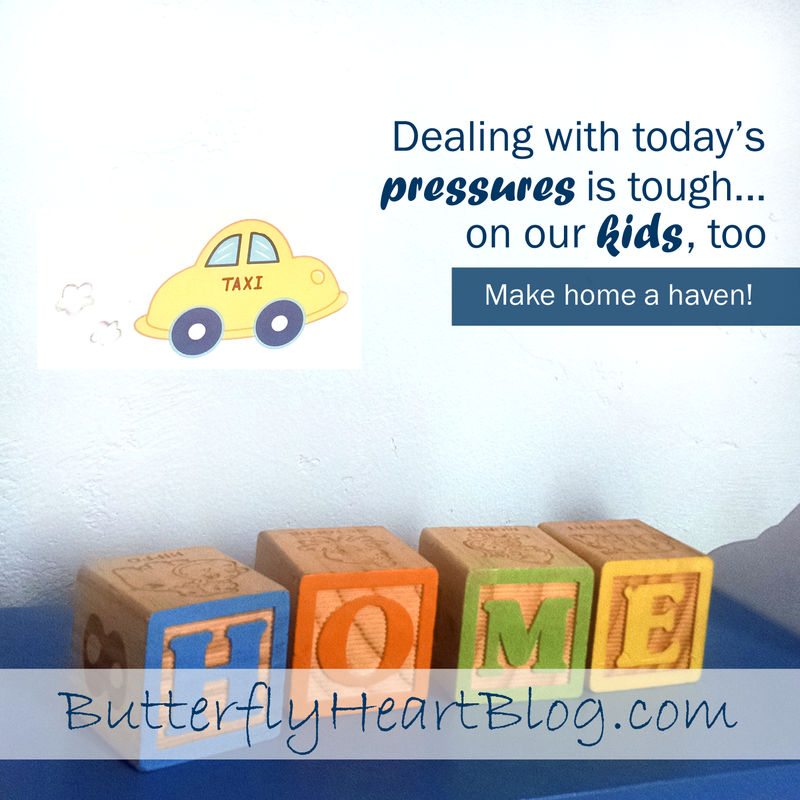 But recently I stopped to think about the stress in my child’s world. As soon as my oldest wakes, he’s on the clock to get ready to go out the door. Did you brush your teeth? Don’t forget your snack. Please double check that I initialed your assignment book. Each day at school he’s learning brand new things. At the same time, he must navigate expectations…from the teachers, his friends, and me. Remember to take the sign-up sheet home with you tonight. Make sure you find me on the playground. Don’t forget to look for your lost boot. After school, the learning and reminders don’t end. At home, we take our role of teacher pretty seriously, wanting to prepare these young ones to become the well-mannered and conscientious adults we wish them to be. Treat your brother the way you would want him to treat you. After dinner, you need to do your homework. Do you have gym shoes for tomorrow? So often I feel like such a nag. Do you? After a full day of being instructed, guided, scheduled, and reminded – don’t we all need a break? When you think about it, our kids are doing battle every day, too. It’s just a different kind. Part of our job is to offer a place to relax, refresh, and recharge after a stress-filled day – it’s called home. And here’s how I’m going to help de-stress my kids. Hugs. Home starts within our arms. It’s a place of comfort and safety. In fact, I read that children need a minimum of 8 touches a day to feel connected. So I’m going to dish out the hugs as often as possible. Off time. There needs to be time to slow down. I’m going to omit things from the schedule when we can; after all, some of it is by choice. And while there’s value in order and routine, we can benefit from breaking up the schedule, too. Like when I spontaneously went strawberry picking last year. BTW, Best. Afternoon. Ever. Music. Stress releases cortisol in our bodies, but too much can tax other parts of our body, like our immune system. Music has been studied to bring our cortisol levels back to normal. While it hasn’t been confirmed, I think many of us would agree that listening to soft music or nature sounds can offer relaxation. So when I think our brains are on overload, it’s time to change the channel to some tunes. And don’t discount the stress relief of an impromptu dance party! Empathy. When I’m stressed out, I rely on my friends. They listen with true interest, offer advice, or just let me vent. Our kids haven’t quite developed these types of relationships yet…where they can let their true emotions show. But we can be that ear and shoulder. Empathy for what they are experiencing will let them open up rather than bottle it up. As much stress that falls on our shoulders, we have the power to lift it from our kids. With more “grown-up” demands than ever, kids today need us not just to teach, guide, and mold. But also to learn how to shut things off. Use silliness to release tension. Find stillness in this world of constant stimulation. Slow down enough to open up about fears, worries, and sorrow. To just be ourselves. Without demands. Without judgement. Just be. By creating a haven at home, we can help lift their stress as we lift their hearts.